The displayed fares were last found on: Wed | 17 April 01:08 AM(EST) . Fares are round trip. Plan your trip with Cheapfaremart to get cheap plane tickets to Flores, Guatemala. Simplifying technology, we make it easy for you to search for flights to Flores, compare Flores flight deals with popular and low-cost carriers and make a booking. Our flight booking engine presents a list of discounted flights to Flores against your search query. Apply filter options like – one-way, round-trip, nonstop, one-stop or two-stop – to find results that are most relevant to your travel plan. 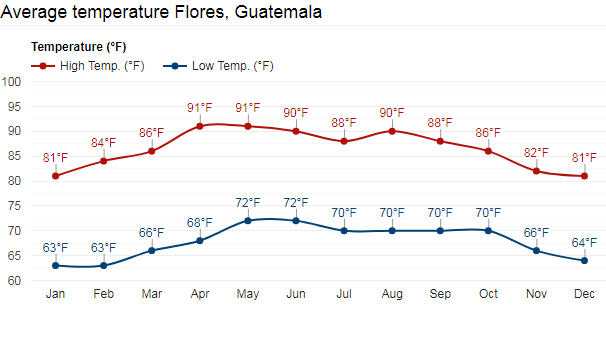 What is the Best Time to Visit Flores, Guatemala? Winter is the best time to visit Flores, Guatemala. Winters start from October and ends by February. The upper-temperature limits stay around the mid-80s. Virtually experience the spring of Las Vegas in Flores. So when it starts freezing in Las Vegas or New York, escape to a warmer Flores for a beautiful holiday. 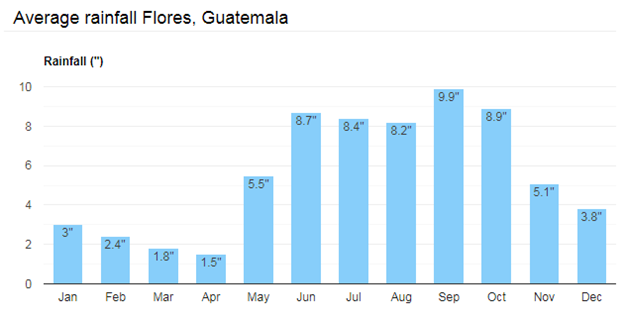 While setting off on your Guatemala vacation in October and November, make sure to have your umbrella. You never know when you might need it. For budget vacationers, June to October is the best time. Airlines drop their fares and hotels their rentals. Savings will help you to extend your Guatemala holiday. To find the cheapest round trip flights to Flores consider departing on weekdays. What Things to Do in Flores? A 10-minute drive from Flores, take you to Actún Can, an underworld of Maya Civilization. This is a natural cave in the municipality of Flores in Guatemala. The entrance of the cave is in the town of Santa Elena. Inside, there are signs to guide you in exploring different areas. Scared of darkness inside? No worries, you will be provided with a speleological helmet with a flashlight. Inside the cave, visitors are expected to maintain silence and do not litter the walls. With a sprawling 99 km² area and 160 meters depth, Lake Peten Itza is the second largest lake in the city after the Izabal Lake. Besides the serenity of the lake, what attracts visitors the most is the archeological heritage of 27 Maya sites present nearby. A visit to Tikal is revisiting the Mayan Civilization. The carbon dating establishes a connection of the ruins to anywhere between 200 and 850 A.D. The ruins contain temples and palaces. The most visited ones are the Lost World (Mundo Perdido) Pyramid and the Temple of the Grand Jaguar. At 70 meters, Temple IV is the tallest pre-Columbian structure in the Americas. Ever got a chance to hike a volcanic crater? A visit to Acatenango in Guatemala may help you live out your dream. However, do it at your own risk. The volcano has got two peaks, namely, Pico Mayor (Highest Peak) and Yepocapa (3,880 m) which is also known as Tres Hermanas (Three Sisters). Acatenango is joined with Volcán de Fuego, and collectively the volcano complex is known as La Horqueta. Mundo Maya International Airport (IATA: FRS) is just outside Flores and is the only international airport in the country aside from Guatemala City. This modern facility with its 10,000 ft. runway is courtesy of the US CIA. The popular airlines serving the city are Avianca, Copa Airlines and American Airlines. How Much Does a Flight to Flores Cost? On the top of the page we have displayed some best Flores airfare deals. However, the fares in the aviation industry are dynamic. The price of plane tickets to Flores is subject to change and non-warranted. Check current cheap air tickets to Flores with our flight booking engine. Why Book Airline Tickets to Flores with Cheapfaremart? Search, compare and book your cheap air tickets to Flores. For help regarding finding the best flight routes and reserve your flight, call us on 1-844-869-5222 (Toll-Free).